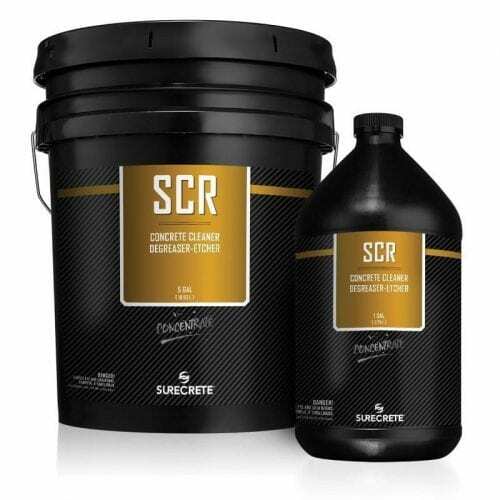 SureCrete’s SCR™ is a concentrated concrete cleaner, degreaser, and etcher which is a safe alternative to muriatic acid for driveways, sidewalks, pool decks and patios. Manufactured for the solution to go into the pores of the concrete and to bubble the impurities out to be rinsed away. Learn how to clean concrete, cement, bricks, and pavers. Super Concrete Renovator (SCR™) is also eco-friendly. 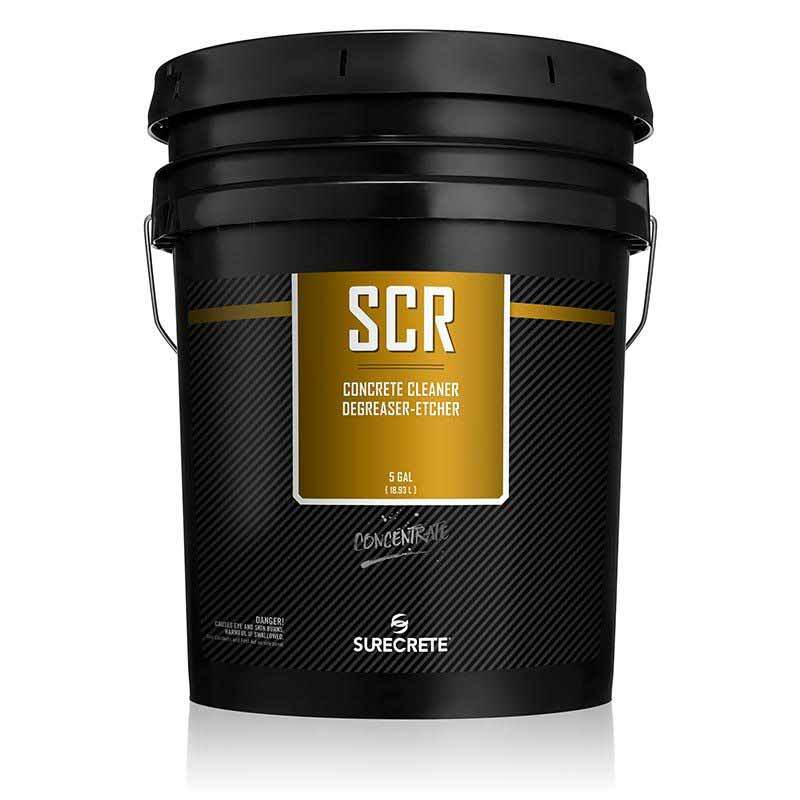 SCR™ formula quickly dissolves mortar, scale, rust, algae, stains, and mineral deposits such as efflorescence. SureCrete’s product is a stronger cleaner than citric acid and a safe alternative to muriatic acid, as it contains no toxic heavy metals or ozone-depleting solvents. 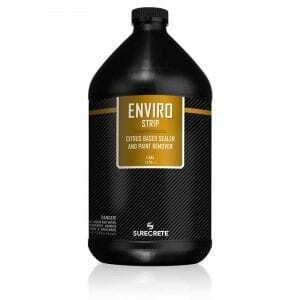 Concentrated concrete cleaner, Super Concrete Renovator (SCR™) is an eco-friendly 3-in-1 cement and brick paver cleaner. SCR™ brings a powerful, degreaser, and etcher which is a safe alternative to muriatic acid. SCR worked by the solution going into the pores of the concrete and bubbling the impurities out to and rinsed away. Application in this situation is 1-1 or 2-1 (part water to part SCR). Even though SCR is a powerful concrete cleaner, it has been designed not to hurt the landscaping. SCR can aid in removing dirt, efflorescence, mold, mineral deposits, rust, and works well to lighten and remove oil and gasoline stains. Cleaning your concrete driveways, sidewalks, patios, porches, pool decks, patio cleaner, sand pavers, and landscape edging has never been easier and more cost effective when using SCR to bring your concrete back to life. In addition to its uses on natural surfaces, SureCrete’s SCR™ is a premier chemical surface preparation solution for decorative cement products. The combination of an etcher and cleaner makes it an ideal application before applying concrete overlays, stains, and acrylic sealers. The etching process will open up the pores allowing for an increase in adhesion and absorption of cement overlays and acrylic sealers and paints. SCR is excellent on thin overlays (such as SureSpray, SureTex, SureBroom, and Micro Topping) and stamped overlays before the application of reactive acid stains, water-based stains, dyes, and Eco-Stain. This application with SCR ranges from 3-1 to 4-1 (part water to part SCR). How to clean concrete driveway without a pressure washer, SCR™, brush in and rinse off. Why Use SureCrete’s SCR Concrete Cleaner? Super Concrete Renovator works for cleaning and preparing countertops for sealers and coatings and also cleaner pavers. Although SCR can operate on natural stone, is was designed to cast countertops and Glass Fiber Reinforced Concrete (GFRC) or concrete paver clean. In each of these applications, the surface is dense and tight allowing for minimal penetration and absorption. SCR™ in a dilution of 2-1 to 4-1 (part water to part SCR) will help open the pores of the surface increase the penetration and adhesion of countertop sealers, such as XS-327 and XS-PC12. SCR can also remove release agents that the surface absorbed during the curing process, ensuring that the secondary coloring system such as reactive acid stains, water-based stains, dyes, and Eco-Stain can be absorbed and create the natural modeling desired.Also used for cleaning before paver sealing. 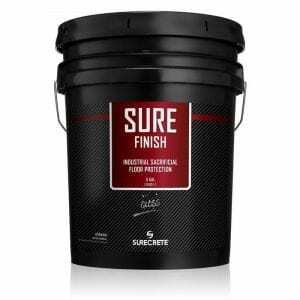 Who Can Use SureCrete’s Concrete Cleaner? With all of the applications that this cleaner can clean; cement, brick, masonry, cleaned pavers, concrete based, patio cleaning and natural stone paved, the days of dirty surfaces could disappear! Whether you are an experienced contractor or a first-time user SCR™ is the strongest, easiest, and most efficient surface cleaner in the market due to its simple dilution rates, no need for neutralization, and its ability to be rinsed with clean water, unlike other cleaners sealers cleaner. SCR once diluted will not harm plants just watch and can be disposed of down a drain. Check out our instructional videos and product reviews for paver cleaning. Pavers installed should be cleaned before sealing. 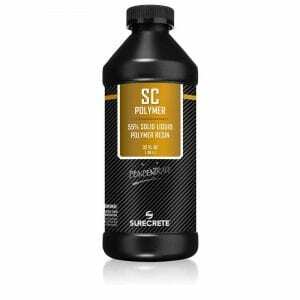 One of the easiest cleaning and profiling agents available, SCR was formulated to be a product anyone can use. Step 2. Dampen concrete surface prior to application of concrete remover cleaner. Step 3. Apply mixed cleaner evenly across cement surface with a pump-up sprayer, being careful to maintain a wet surface. Step 4. While cement surface is still wet, work cleaner into the surface using a nylon bristle broom. Step 5. Before concrete cleaner can dry, rinse the concrete surface with hose or power washer and make sure all residue has been removed. Note: Best results: Apply in temperatures above freezing and below 90°F (32°C). Apply evenly 2:1 diluted product across a surface of the concrete. For best results are achieved by spraying from a plastic pump-up sprayer. While still wet with product, scrub concrete with a stiff bristle broom. Before SCR can dry, rinse with a garden hose or power wash with a fan-tipped pressure washer. Dampen concrete with water from a mist of pump-up sprayer or garden hose trigger nozzle. 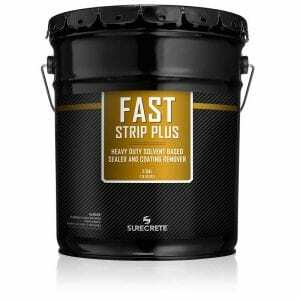 Apply evenly 4:1* diluted product across the surface of the concrete. Best results are achieved by spraying from a plastic pump-up sprayer. Before SCR can dry, gently rinse with a garden hose or power wash with a fan-tipped pressure washer. NOTE: stronger dilution rates may be required for an adequate profile. Some surface preparation may require other measures that should be evaluated (e.g. grinding, shot blasting). Dampen concrete with water from spray mist of pump-up sprayer or garden hose trigger nozzle. Apply evenly 2:1* diluted product across the surface of the concrete. Best results are achieved by spraying from a plastic pump-up sprayer. Keep floor wet with frequent rinsing. Mop residue until rinse water is clear or utilizes water extraction equipment. Dampen concrete with water from the mist of pump-up sprayer or garden hose trigger nozzle. Apply evenly 4:1 diluted product across the surface of an overlay. Best results, spraying from a plastic pump-up sprayer. Wet XS piece with water from pump-up sprayer or sponge. Brush or sponge 3:1 diluted product onto vertical edges of cast concrete pieces first. Spray or sponge 3:1 diluted product from the plastic pump up sprayer onto the surface. While still wet with SCR™, gently brush surface with a soft bristle brush. Do not allow the diluted product to stand on the surface, rinse immediately. Dampen stamping tools or molds with water from the mist of pump-up sprayer or sponge. Spray 4:1 diluted product from plastic pump-up sprayer onto tools or molds. While still wet with SCR™, gently brush surface with a stiff bristle brush. Before SCR™ can dry, completely rinse the surface. For use by trained professionals that have read the complete SDS. SCR™ may be corrosive to some metals; ALL metals should be protected. SCR™ is not the best choice for surface preparation for DK or ColorTec coating systems. These systems require a CSP (Concrete Surface Profile) 1-3. Hard-Trowelled concrete surfaces may not achieve the appropriate CSP 1-3 profile by just using SCR™, in these cases shot-blast-ing or grinding is recommended. Do I have to neutralize SCR? No, it just needs to be rinsed cleanly from the surface! No neutralization required! I used SCR and my coating peeled off! What happened? One of two things – either SCR was not applied strongly enough and your coating was unable to form a good bond with the substrate, or the SCR was left on the surface too long and formed a residue preventing a clean surface to bond to. Make sure your surface is clean before you start your new coating!